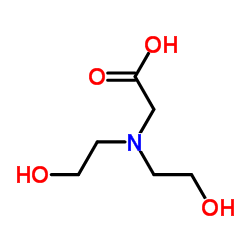 Bicine is a buffering agent used in biochemistry and molecular biology that was selected and described by Good et al. It is a zwitterionic, bis(2-hydroxyethyl)amine buffer that is useful for a pH range of 7.6 – 9.0. It is commonly used in protein crystallization, in the study of enzymatic reactions, and for electrophoresis. It is used in thin layer ion exchange chromatography for protein resolution, as well as a multiphasic buffer system for SDS-PAGE of proteins. It is soluble in water at 0°C up to 1.1 M. Bicine forms a complex with most common metals so stability constants and concentrations should be taken into consideration when choosing this buffer. The Biological Buffer Selection Guide includes catalog number, pH range, pKa, applications, stock solution protocol availability and comments for the most common biological buffers.